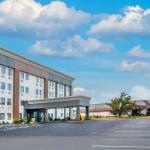 Flat-panel TVs free internet and breakfast and a handy I-270 locale near major business and leisure destinations make it easy for our guests to choose the non-smoking La Quinta Inn & Suites St. Louis Hazelwood Airport North. The four-story La Quinta Inn & Suites St. Louis Hazelwood Airport North provides 99 non-smoking rooms with flat-panel HDTVs multi-plug panels free high-speed internet coffeemakers and hairdryers. Breakfast is on the house. Guests can stay in shape in the fitness room and tidy up travel clothing at the guest laundry. Parking is free for registered guests and park-and-fly packages are available for purchase. Pets stay for an additional fee. Just off I-270 in the St. Louis suburb of Hazelwood La Quinta Inn is less than 20 miles from downtown the Gateway Arch and Busch Stadium. St. Louis Mills provides top retail therapy five minutes west. Heading 20 minutes south leads to a variety of hotspots including the St. Louis Science Center the Highlands at Forest Park and the St. Louis Zoo. Corporate guests are less than two miles from IBM and within 20 minutes of XO Communications. Lambert-St. Louis International Airport is six miles south. Dogs of all sizes are allowed. There are no additional pet fees. Dogs may not be left unattended, and they must be well behaved, leashed, and cleaned up after.